Have you seen these in the specialty food stores? My girlfriend Lisa served these at book club many months back and I fell in love with them. 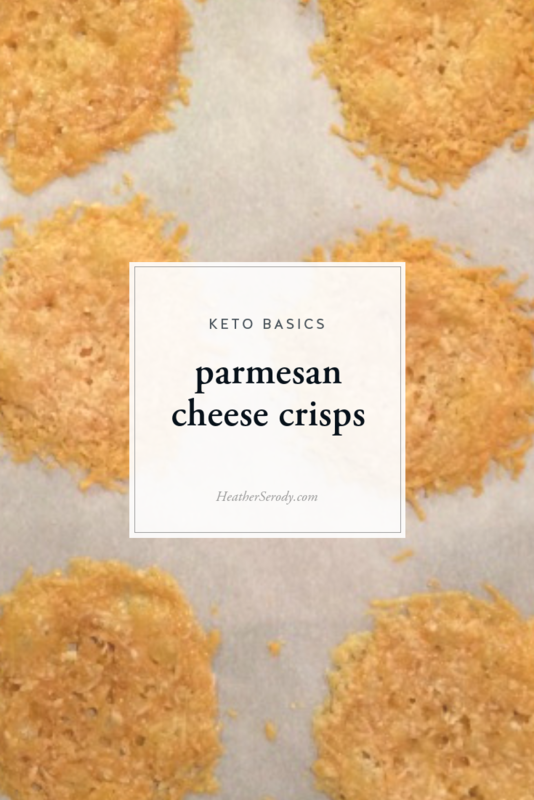 They are a basic in your keto eating plan and great to have on hand when a carb craving strikes. They also happen to divine with a glass of wine! 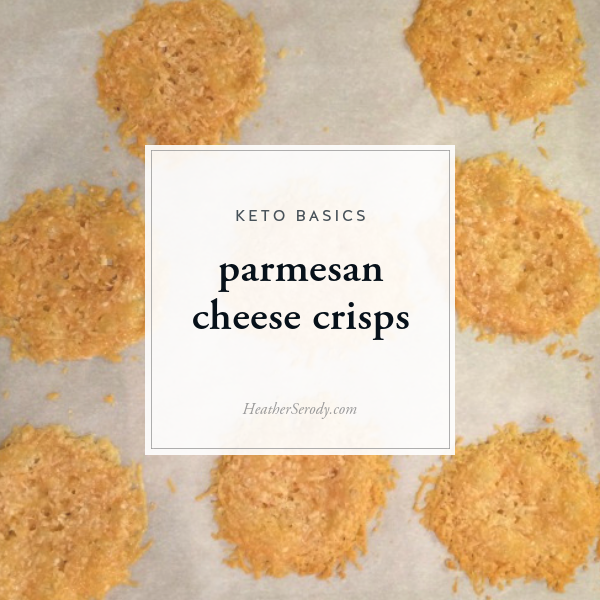 They possess the crispy crunch of a cracker but without any refined carbs, since these are made from 100% parmesan cheese. There's no reason to pay $7.99 at Whole Foods for a small 3 oz. container when you can easily make them yourself in about 15 minutes. A 6 oz. 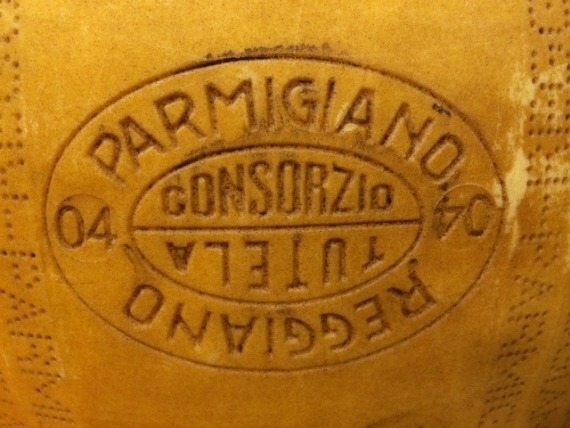 container of grated parmesan will make approximately 24 parmesan crisps. Preheat the oven to 350º F and line a sheet pan with parchment paper. Lightly spray or grease your parchment paper with avocado oil spray or butter. 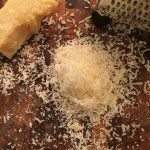 If you are grating your own cheese, grate the cheese using the small, not the smallest, side of a box grater. 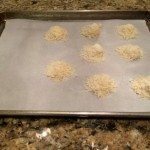 Scoop grated cheese, using a tablespoon or a cookie dough scoop, and place it on the parchment-lined sheet pan in mounds. Press the middles of each mound down lightly with your fingers, and push any strays back into the cheese circle. Bake for +/- 8 minutes. Ovens vary so watch your crisps carefully toward the end. When they are bubbling and just beginning to darken at the edges and your entire house smells fantastic, they are done. Remove from oven and allow your crisps to cool & firm up for at least 5 minutes before carefully lifting with a spatula, or just peel off with your fingers. Be careful as they break easily. Serve immediately. Do not cover or they will go soft. These delectable babies would never make it past my mouth as I took them from the pan…all of them….forget it….which is why I do not make them. The nearest I come is the cheese that drips out of my grilled cheese and lands to crisp up. 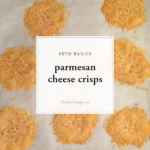 Heather, Kim T referred to some organic, non GMO popcorn as snack crack…these cheese crisps, for me, would definitely fit that description ! 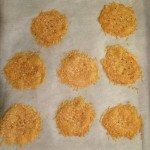 I once made cheddar cheese crackers for a party, about 4 dozen, and yep, only about a dozen made it to the party. But if one has adequate control and is not stark raving crazy for cheese and all things made with cheese ( after all I am the sign of the rat in Chinese astrology) then this is a simple, wonderful recipe .